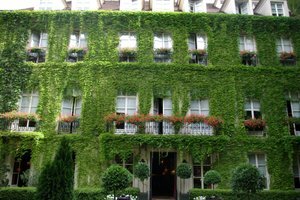 The Pavillon de la Reine is a beautiful, small gem of a four-star hotel on one of the loveliest squares in Paris, the Place de Vosges. It’s always a stop on my Marais tours and whenever I show it to clients, not only are they amazed by the stunning surroundings, but also the gracious and friendly concierge Jonathan Buckles charms them. Jonathan Buckles is the concierge on Mondays through Wednesdays and I met him for a chat after work last week in the elegant and cozy lobby with dark wood beams and a fireplace. Jonathan is quite tall, over six feet, and is a striking presence in his uniform of a royal blue waistcoat, navy blue vest with gold buttons and crisp white shirt with a shimmering, orange tie. His ruddy cheeks and pale skin are a give away that he is English and he was born in Ashford, England to a French mother and English father. He lived in Ipswich until the family moved to Marly le Roi, a suburb of Paris, when he was 10 years old. When he was 15, he moved to Paris and has always lived in the 8th arr. He took a year off to live in Costa Rica and is fluent in French, English, and Spanish. 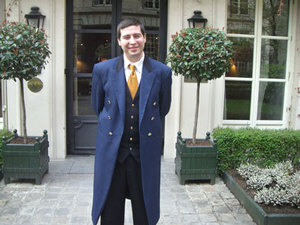 He started his hotel career at 18 as a bellboy at The Ritz Hotel, followed by a stint as a bellman and later behind the reception desk at the George V, then made his way to the Pavillon de la Reine, having now worked there for the last 18 months. His favorite part of the job is speaking to the guests and hearing them share their stories from around the globe, which he considers like traveling the world without ever moving from behind his desk. Many of the guests have become friends and have invited him to visit when they returned home. The majority is from the U.S., England and Italy and some have fallen in love with the Marais so much, that they have enlisted Jonathan to assist them in buying apartments in the neighborhood. The secret to his popularity is being a good host and treating people like they were guests in his own home. I asked Jonathan what was the most unusual request he ever had from a guest, and he told me it was making elaborate and extremely detailed arrangements for a wedding proposal. It involved shipping furniture from the U.S. to place in Butte Chaumont Park for the first half of the proposal, then having the bride to be whisked away in a specific car, blindfolded so she didn’t know where she was going, and timing it so that she would arrive just in time to see the sparkle lights go off on the hour. The hotel has had its share of celebrity clients who like the home-like ambiance and low- key feel to it. A top French fashion designer lived in one of the suites for two years. 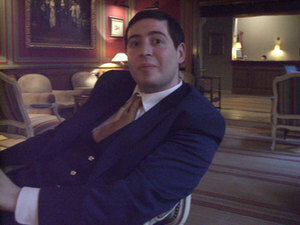 Jonathan prides himself on knowing all best restaurants, shops and sites to see in the Marais and all over Paris. Below are some of his Marais recommendations. 28 Place des Vosges, 3 arr.